I love making wings. Even if it is just for the fact I know what is going into them. First came my good ‘ole, finger licking, traditional wing recipe. Then I ventured into Asian Inspired Wings. And out of necessity this week, I bring you stove top wings. The oven was off limits, and it was WAY to cold to grill, so I had to come up with a way to do without, and still have my game time favorite food. When I was a kid, my parents had pretty big get-togethers on a very frequent basis. Since we lived in Florida, and had a smaller house, these events normally took place in the backyard around the grill, and my dad was FAMOUS for his wings. Unfortunately I don’t have his exact recipe (and last time I asked him he didn’t remember), but what I did remember was the secret was to boil the wings in a delicious base to cook them before throwing them on the grill as a way to crisp them up. Armed with these memories, I set off to duplicate my dad’s wings…sans grill. It started out as mimicry, but took a left turn after the wings were boiled and I needed to figure out what to do with them then. I am happy to report that the result was a tender, juicy yet crispy, flavorful wing that will become my #1 wing recipe…for now…. Delicious, homemade chicken wings that are perfect for your favorite sporting event, or any night! Bring pot to a low boil, allow to boil for 10 minutes or until chicken is cooked through. Once chicken is cooked, pour oil into a heavy pan and heat over medium-high. In batches that will fit in your pan, remove chicken from the liquid and sprinkle the flour mixture on each side of each wing. When oil is hot enough that it sizzles when a wing hits it, add your first batch of wings. Allow to cook for about 1 minute, or until the side down browns nicely. Flip and cook for another minute or until nicely brown. Remove wing to a paper towel lined plate. Repeat for remaining batches of wings. Serve as is, or with your favorite dipping sauce. 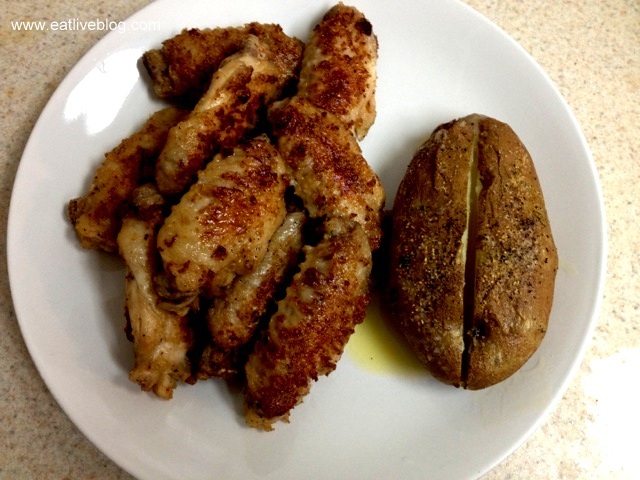 This entry was posted in Recipes and tagged appetizer, chicken, chicken wings, dinner, game day, recipe, snack, superbowl, wings by reneeh. Bookmark the permalink. I would never even think to boil the wings first – what a great idea! And good to have a version that doesn’t need the oven. They sound delicious! Thank you for sharing. Your wing reciepe sounds awesome & easy! I’m so making them for the super bowl! I just did my 1st batch following your recipe and I got to say your recipe is amazing . Boiling them 1st never crossed my mine . I also have to say I think I’ll never order out for wings again. Thank you so much for sharing your recipe. I really think your wings will be a Super Bowl hit at my Superbowl party! Thank you! What a nice comment, thank you Michael! I hope the rest of your party enjoyed them as much as you did!